We got a flyer today announcing our local family-owned home and hardware store is going out of business after 90 years, the year my father was born. Our local newspaper ran front page headlines on the topic and it occupied the editorial column. 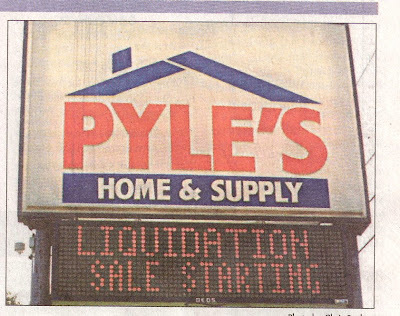 From the time that the groundbreaking for a mega shopping center containing a Lowes was announced a few years ago, I knew with great sadness that Pyles time was limited. The family fought on heroically for a several years trying to match the pricing and overcome the new traffic pattern that made it difficult and dangerous to access the store, but this fall it looked barren and shabby. The owner said that he was just tired out. I sadly remembered the days when it was bustling with home improvers and its glittering and extensive Christmas shop was full of every kind of ornament you can imagine and wistful children. I used to come there with my daughter to pick out a few special ornaments every year and still have the fragile peapod, ear of corn, frosted plum and bear that we picked out so many years ago. A month ago, I was in the nearby community of Oxford and stopped in at the home and farm supply store. It was bright with wooden floors and the lumber yard was full of life. It radiated the warm friendly family atmosphere that Pyles once did and they were starting to put out the Christmas displays. I have heard that the developers of another big box store have finally decided to start construction nearby, but I hope that Oxford Feed and Supply lasts long enough to give another generation of children the joy and excitement of small town life. How sad :( We'll have to go support Oxford when I'm back.